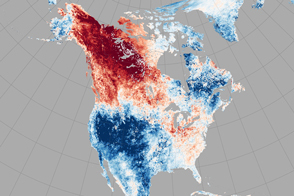 Forget the transition period between seasons: in March 2019, Alaska jumped from mid-winter right into late spring, setting monthly temperature records in many cities and towns. Meteorologists have noted that the unusually hot month was part of a long-term warming trend in the state in recent years. 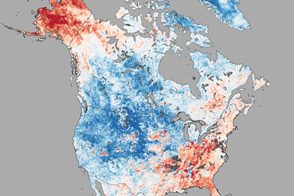 The map above shows land surface temperature anomalies from March 1-31, 2019. 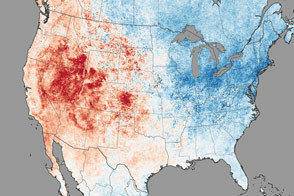 Red colors depict areas that were hotter than average for the same month from 2000-2012; blues were colder than average. White pixels were normal, and gray pixels did not have enough data, most likely due to excessive cloud cover. This temperature anomaly map is based on data from the Moderate Resolution Imaging Spectroradiometer (MODIS) on NASA’s Aqua satellite. March 2019 began with an unsettled weather pattern that brought warm, wet storms to the state, according to the Alaska Climate Research Center. By mid-month, a high-pressure ridge developed and stayed in place for weeks, producing mostly clear skies and very warm temperatures. The “warm” month in Utqia&gdot;vik did not mean it was a dry month. In March 2019, the town received more than four times the normal amount of rain and twice the amount of snow. While the north and northwest parts of the state were wetter than usual, other parts were unusually dry. 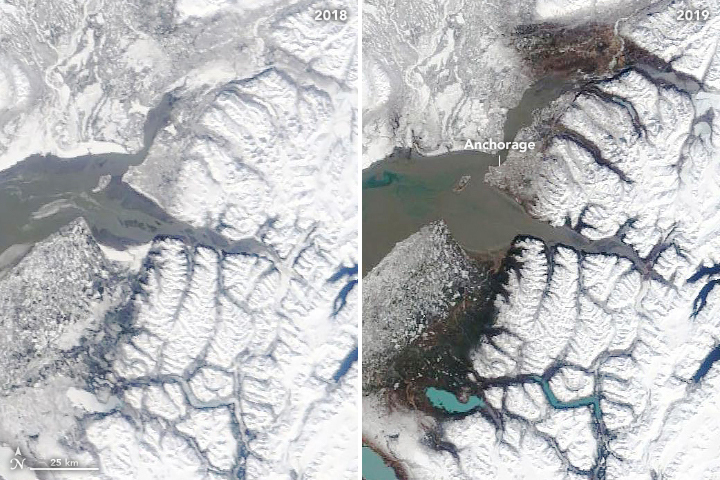 These natural-color images, acquired with MODIS on NASA’s Terra satellite, show Anchorage on March 30, 2018 (left), and March 30, 2019 (right). According to reports, March 2019 is only the second time on record that there was no measurable snowfall in Anchorage during the month. Warm air temperatures, stormy weather, and warm sea surface temperatures have taken a toll on sea ice in the Bering Sea west of Alaska, bringing its extent even lower than in 2018. Typically, sea ice here reaches a maximum extent in March or early April. 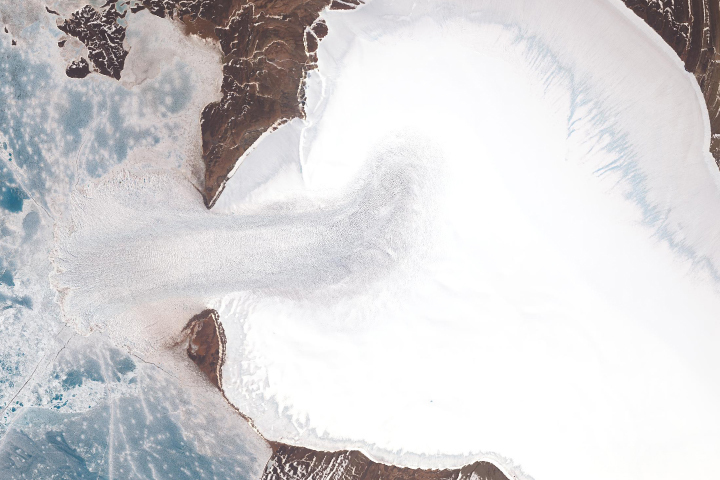 Images published by NOAA, however, show that by April 1, 2019, the sea was already largely free of ice. This melting in the Bering Sea put a large dent in the overall Arctic sea ice extent, which on April 1 hit a record low for the date. NASA Earth Observatory images by Lauren Dauphin, using MODIS data from NASA EOSDIS/LANCE and GIBS/Worldview and data from the Level 1 and Atmospheres Active Distribution System (LAADS) and Land Atmosphere Near real-time Capability for EOS (LANCE). Story by Kathryn Hansen. 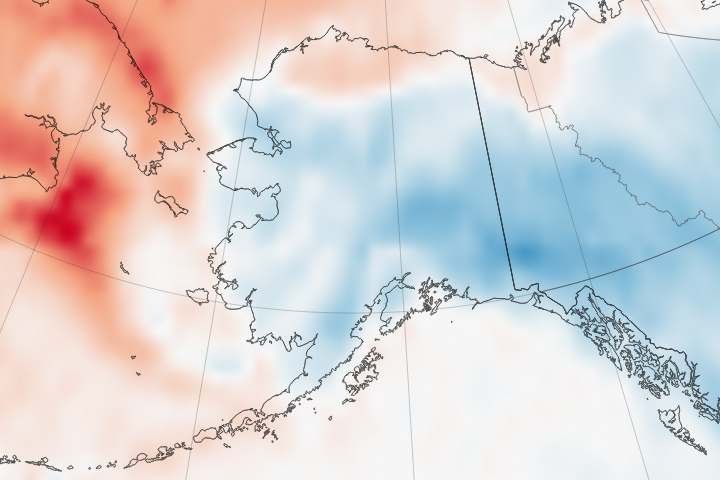 Alaska Climate Research Center (2019, March) Alaska Statewide Climate Summary March 2019. Accessed April 8, 2019. Anchorage Daily News (2019, April 4) March records for warm weather across Alaska were ‘obliterated’ this year. Accessed April 8, 2019. 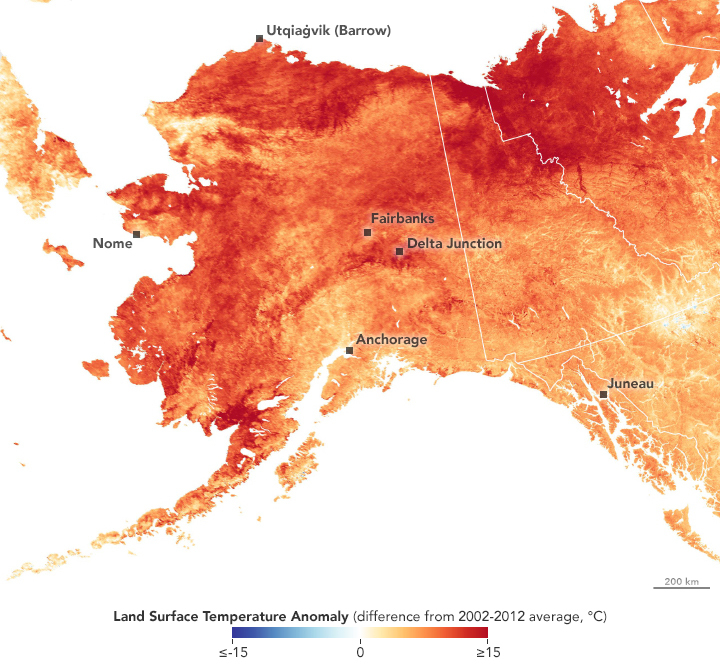 CBS News (2019, March 28) Alaska temperatures expected to soar 40 degrees above normal this weekend. Accessed April 8, 2019. 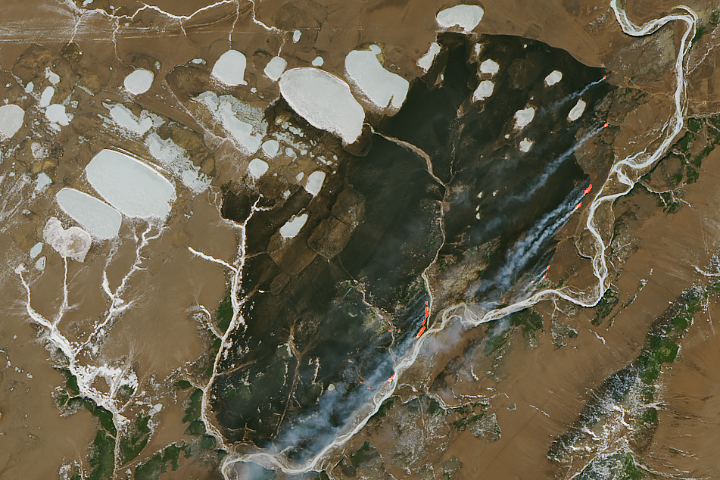 NASA Earth Observatory (2015, May 27) Baked Alaska. National Snow & Ice Data Center (2019, April 3) Spring Arrives in the Arctic. Accessed April 8, 2019. 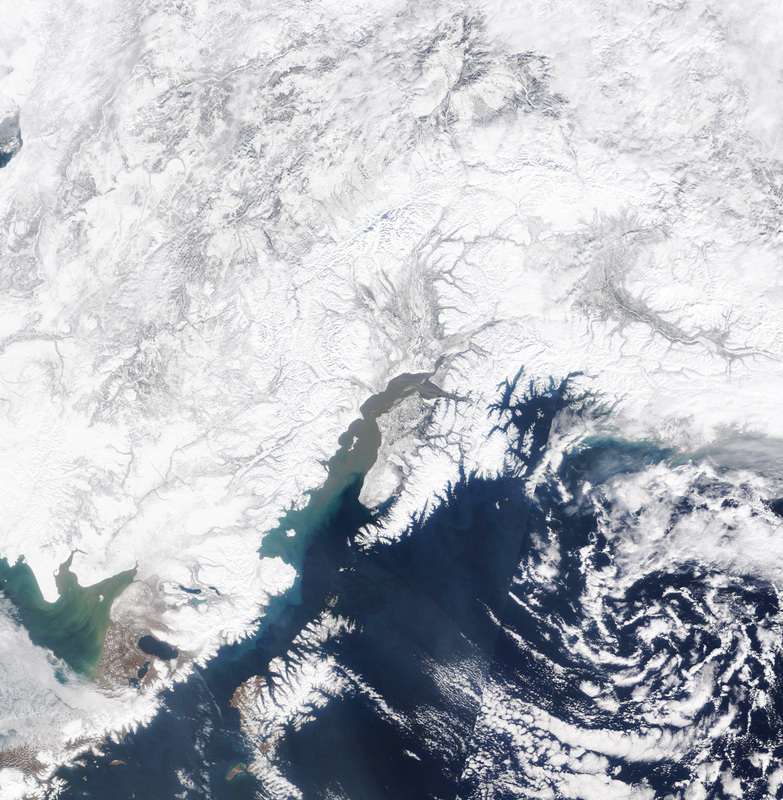 NOAA Satellite and Information Service (2019, April 1) Bering Sea Appears Largely Ice-Free from NOAA-20. Accessed April 8, 2019. 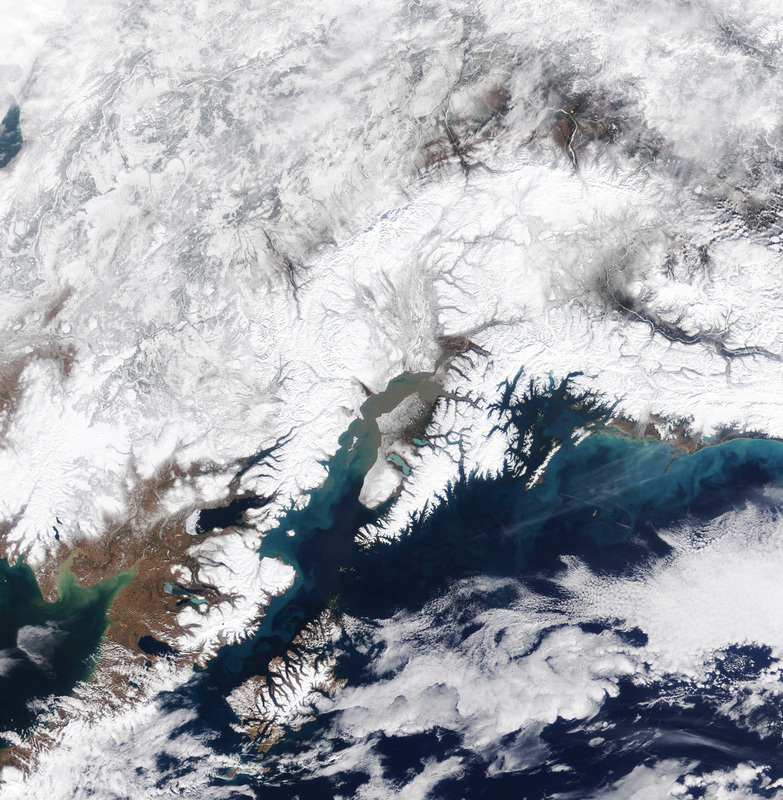 Phys.org (2019, April 4) High March temperatures shortened Alaska’s winter weather. Accessed April 8, 2019. 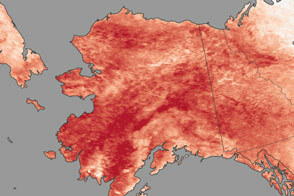 Popular Science (2019, April 2) Melting roads are just one downside of record-breaking Alaskan heat. Accessed April 8, 2019. 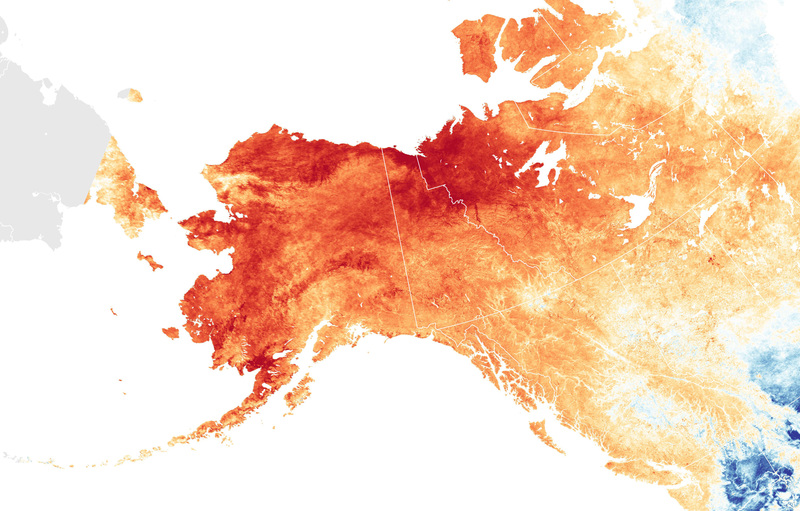 The Washington Post (2019, April 2) Alaska’s historically warm March ended with even more records. Accessed April 8, 2019.